1. What are some tips to write college admission essays? The list of essay-writing tips is long, but some of the best are: start early; include a real-life story, engage the reader at the start, focus on one-point about yourself, don’t try to impress, lose the 5-paragraph essay format, write in a more casual and familiar style, everyday topics work the best, don’t list accomplishments and activities, show your grit by sharing a problem you faced, and above all, make it personal and mainly about you. Learn more: What Makes a College Application Essay Great? 2. How do I write college admission essays? Start by reading the prompts to understand what they want you to write about. Then decide what you want to showcase about yourself in your response. Remember, the goal is to demonstrate your writing ability, but more than that to show your target schools something unique or unexpected about yourself that they would not have learned from other parts of your application. Try to find a topic that will help you stand out from other students. It doesn’t have to be impressive; just something interesting about yourself. 3. How to start college application essay? Always start by reviewing the prompts, or questions. But remember, these are mainly to help you find a topic you can use to showcase something about yourself, and what sets you apart from other applicants. Brainstorm ideas for topics, and look for real-life moments or mini-stories (“times”) from your recent past that you can share to illustrate a unique quality, characteristic, talent, or core value. As far as how to literally start your actual essay draft (the introduction), I highly suggest sharing a real-life experience or moment that illustrates the larger point you are making about yourself in your essay. For example, if you want to showcase how you are a creative person, consider starting the essay recreating “a time” you did something creative, or “a time” when your creativity was tested, or developed, or helped you deal with some type of problem. Then you are set up to continue and explain what that experience meant to you, what you learned from it and why that matters to you, others and the world. 4. How bad is it to make up stuff for the college app essay? Don’t waste your time making up things for your college application essay. First, this is totally unethical—it’s lying. Second, you will only hurt yourself since the whole point of these essays is to help colleges and universities decide if their school is the best place for you. If you give them phony information, they cannot help you find the best fit for your learning needs and goals. Third, college admissions folks have read hundreds of essays, and they have great radar at spotting bogus essays. Do yourself a favor and trust that writing in your most authentic teenage voice and words will be better than anything you could make up. Often, it the little imperfections, confessions and flaws that make you the most likable to schools. The truth always works the best. Trust it. Potential ways to address the “Why Major” essays? One of the best ways to write about your selected field of study is to share one specific incident or moment that first inspired your interest in your intended major. Then continue by describing activities and experiences from high school (both academic and outside school; clubs, jobs, etc.) that furthered or deepened your interest in this major. Also, explain why you believe this major or field of study has meaning to you on a personal level, as well as value to the world in general. Learn more: How to Write the UC Transfer Essay: Why This Major? Is using humor a good idea in the common App essays? Some of the best college application essays include real-life stories that are entertaining or amusing, often because the student shared some type of problem or challenge they faced, and what happened included something on the funny side. Who doesn’t like a good laugh? However, don’t try to write something funny or a comedy sketch. There’s a big difference! That usually backfires. If you share an incident or event that happened to you to showcase something specific about your personality or character, and it happens to be funny, go for it. (It’s often funny when we share times we messed up.) Just write it straight and let the story and humor speak for itself. Look for real-life incidents or problems that included something unexpected, and you will often find them comical. 7. Is talking about moving in your essay too cliche of a topic? Students have written about moving quite a bit in these essays, mainly because the change in schools and friends affected them. However, like other often overdone topics, such as playing sports, going on mission trips and working with special needs students, writing about moving can be cliche because so many students have had these experiences. You can still write about a move, but you need to look harder to make sure you include life lessons that aren’t predictable. It’s not what you write about, but what you have to say about it. With a move, you need to say more than how it was hard making new friends and fitting in. There needs to be something else that challenged and changed you on some level. Look for something you never expected to happen or affect you from the move to help set your essay beyond the cliché. 8. Is it appropriate to write about religion in essays? Like writing about other hot-button topics such as death, illness and politics, it can be tricky to write about religion in an essay. However, if your religion or something related to your spiritual beliefs has been defining for you, you could write a powerful essay. Make sure the essay is not just about your religion, or a long explanation about the dogma, or uses too much religious jargon. Instead, consider writing about a personal challenge, and working in how your religion helped you handle it. Make sure the essay highlights something about your personality as well as what you believe. If you grew up in an extreme religion that you left, that could be an excellent topic since it shows how you learned to think for yourself. 9. Is an essay about politics a good topic? Politics is often on the list of “red flag” topics not to write about. That doesn’t mean you can’t write an excellent essay that somehow involved politics, however. Do not write an essay about only your political beliefs. The essay needs to be about you, not politics. If you have a specific experience, event or incident that happened that you want to share to showcase something about what makes you unique, and it happens to involve something political (like interning for a local politician or working on a campaign), that could make a great essay. No matter what you write about, never make partisan statements where you take a side because the last thing you want to do is offend or anger a college admissions officer who does not share your political beliefs. Example: “I love Obama” or “Trump is my hero.” You can include what you learned working in a political arena, but keep your political opinions neutral or far in the background. Learn more: Find a Great Topic! 10. Importance of stories in a college essay? Stories are your best friend when writing a college application essay, especially a personal statement. There’s no better way to “show” the reader something about yourself than by sharing something that happened to you. Above all, stories are interesting and make the best “grabbers” or “hooks” for the introduction of these essays. Nothing draws in a reader than “a time” something happened. If you start with a real-life story, your introduction will be specific and engaging, as opposed to a general opening statement that is dull. Stories are the best way to share an example of a larger point you are making about yourself. For example, instead of explaining how you are creative (or any personal quality or characteristic) in your essay, share a real-life story about a moment, incident or “time” you did something creative. See the difference? 11. Is it ok to include expletives in the college essay? Swearing is offensive. In general, you want to use real-life, everyday language in your essays. However, there’s no need to use actual expletives. If you share a story where someone swore, and it’s essential to conveying the power of the moment, find a different way to let the reader know. Example: My dad was so angry with me that he let out a string of curse words under his breath. You can use “mild” swear words, such as hell or damn if you are quoting someone, but only use them if it enhances what you have to say. Bottom line: if you think a word is offensive, don’t use it. 12. 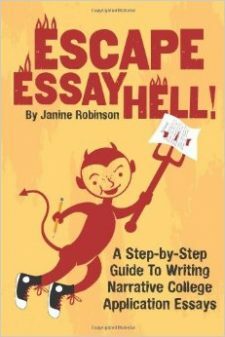 How to think of college essay topics? Then brainstorm moments, incidents or experiences from your recent past that illustrates that quality or characteristic. Another way to discover awesome topics is to look for “times” you faced any type of problem. These experiences often make ideal topics to showcase how you handle problems, what you learned and what that matters. These problems don’t need to be catastrophes, although those can work, too. Problems come in many shapes and sizes, such as challenges, mistakes, failures, set-backs, changes, flaws, phobias, etc. Trust that “mundane” or everyday topics can make terrific topics—it’s all about what you have to say about them. Sample topics: washing cars, obsession with karaoke, scooping ice-cream, riding public busses, having five older sisters, dealing with dad’s alcoholism, having big feet, etc. To write or not to write about disability? Writing about a disability is a natural topic for a college application essay, because often these are highly defining. How could being blind, or using a wheelchair, or having severe dyslexia not shape who you are in some way? The key to writing about a disability is to share how it has challenged you (and feature a moment or incident that helps the reader understand what it’s like to be you), but also spend most of essay talking about what you have learned about yourself, others and the world by dealing with it. The key to making sure your essay is not cliché when writing about a potentially common topic is to look for life lessons that were unexpected. Can you use contractions in a college essay? These essays are less formal in nature than the typical academic essays you wrote in English class. Because they are supposed to be more casual and familiar, it’s often fine to bend some of the rules of the English language. For example, it’s ok to use contractions (such as I’m instead of I am). Read your essays out loud to make sure they sound consistent in tone and voice. Of course, with the contractions, try not to overdo it. A little goes a long way. What do colleges look for in an essay? One of the main things colleges use essays for is to help the admissions officers differentiate students from each other. Without essays, they only have colorless test scores, grades and lists of activities to get a sense of the applicants. So you want to find something to write about yourself that will stand out from the crowd. Above all, the colleges are trying to determine whether you are the right “fit” for their school, and to do that they need to get a picture of your personality and character. They want to see that you can write, that you are interesting, that you value thinking and learning (called “intellectual vitality”), that you have grit (raw determination), and above all, that you are likable. 16, Is it okay to write a common app essay about a time I experienced failure because I slacked off? You can write an essay about times that your grades slipped or you slacked off for a time in high school as long as you make it clear that you have recovered. These can make strong essays because they can help explain lower grades or other blips in your academic record. However, you must not make excuses for your slacking, but instead provide an explanation (illness in the family, your own depression, bullying, a move, etc.). Spend the majority of your essay talking about how you got yourself back on track and what you learned from that experience that will make you all the stronger in the future. 17. Just how important are the application essays? Most college and universities say these essays are very important in the admissions process, although it’s impossible on an individual level to know what part they played in acceptances and rejections. Most admissions officers say the essays are often the only tool they have to get a sense of the applicant’s personality and character—to “put a face” on the application. Especially at the most competitive schools, where almost all the applicants have near-perfect grades, test scores and extracurricular lists, these essays often end up as one of the deciding factors. Students should not try to worry how much they matter, and instead write the best essay they can to help them differentiate themselves from the competition and give their target schools a clear sense of their individuality. Can I write a college essay bluntly? You should write your college application using a casual, familiar tone and voice. One tip is to try to write more like you talk, using everyday language as opposed to the more formal tone of academic essays (don’t try to force in long, SAT vocabulary words!). Share your personal stories to illustrate what you want to showcase about yourself to your target schools, and then explain what you learned in the process. You can be direct and candid about your experiences and how you felt during them. Steer clear of overly flowery writing or slipping into that “trying to sound smart” voice of typical English papers. Stick to the truth, be candid and get out your thoughts. Then go back and edit them to strike the right flow and tone. The prompt for essay supplements that asks about why you are a fit for their school, or why you want to go there, or anything that asks about why they should admit you, is one of the most common prompts colleges and universities ask students. Don’t waste your time telling the school how great it is or how much you love it. The key to answering this prompt is to make a case for how that school can help you meet your educational and personal goals. To do that, do some research (scour their web sites) to learn specific details about what that school has to offer—such as courses, programs, internships, study abroad, clubs, professors, facilities—that will support your interests, field of study or major. Writing about mental illness in college essay? If you deal with a mental illness, such as depression, anxiety, OCD, anorexia, etc., you can write a powerful essay about this for your college application. However, you need to make sure that you make it clear that your mental illness has not stopped you from being a productive and balanced person. You can share the challenges of your illness in your essay so the reader understands how hard it has been, but you need to spend most of your essay explaining how you have learned to handle it or manage it, and not let it stop you from your academic, social or other activities and goals. In fact, you most likely can include how dealing with this mental illness has made you even stronger and prepared you for college. STAY TUNED FOR 20+ MORE NEXT! Got your own questions? Just ask in the comments section and I will do my best to answer it for you asap! These are great! As a college admissions coach myself, I get asked these exact same questions all the time. Thank you so much for writing and sharing this post.